We're pleased to announce a visit from Andrew Heben, Project & Program Director for SquareOne Villages in Eugene. He will offer a public presentation Thursday, November 19th from 6-8:30pm at the Cathedral of the Rockies, 717 N 11th Street in Boise. The event is free, but seating is limited. Visit our FaceBook page to RSVP and let us know you plan to attend. Sponsors include the Boise/Ada Homeless Coalition, Boise Co-op, and the Boise Alternative Shelter Cooperative. If you are unable to view the video at right, click here. Presentation focus. Eugene is one of many U.S. cities with sizable homeless populations, which has led city and county officials, nonprofits, businesses and even citizens to collaborate on innovative approaches. One such approach is Opportunity Village Eugene, which has received national attention for its social and economic benefits. Andrew will outline the conditions that have inspired this and similar models, the planning, design and collaboration necessary to create a village, and the social component of what is becoming an affordable alternative for those falling though the cracks in our economy and housing market. This is not a forum on Boise's homeless policies. "A very pragmatic approach that was inspirational to getting people in our community to see what could and should be done." Andrew Heben has a background in urban planning and is the author of Tent City Urbanism: From Self-Organized Camps to Tiny House Villages. He has traveled throughout the U.S. to study over a dozen tent cities organized by the homeless, and spent time living at one in Ann Arbor, Michigan known as Camp Take Notice. 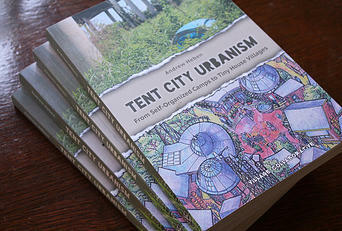 The book is an expansion of Heben's urban planning thesis at the University of Cincinnati; in a sense it represents an ironic recognition that today's tent cities and homeless camps can in fact be traced to trends in planning and community policing during the 20th century. "A revolutionary document, a manifesto and manual wrapped in a visionary on-the-ground journey into which the rest of us are invited." Many of the ideas in his book have been put into action through the co-founding of SquareOne Villages, a Eugene, OR based non-profit organization with a mission of creating tiny house communities for those in need of housing. Their first project was Opportunity Village, which has been open for two years and provides transitional micro-housing to otherwise homeless individuals and couples. They are now moving forward on Emerald Village, which will provide an innovative model in permanent, affordable housing. "The vision to create a living place of vitality, safety, and human scale is an indomitable urge that likely resides in all people. In fact, history bears out that people create sustainable places and mutual support networks whenever they have access to enough land, resources, and help. That said, Opportunity Village, supported mightily by Andrew Heben, has taken the lead in demonstrating the remarkable inspiring effects and healing power of such a vision in action. The idea that a group of people can undertake democratic processes in such a way that they repair themselves and create a sustainable expression of place will be of interest to everyone." Who should attend. Planning and housing professionals, social entrepreneurs, policy makers, social and human service providers, homeless and housing advocates and providers, those with an interest in cooperative shelter and housing models, and media. Local perspective. Seen though a national lens, the number of individuals experiencing homelessness in Boise is comparatively small. Until cities reach a crisis, they are often reluctant to support alternatives to traditional congregate shelters, tenant-based rental assistance vouchers, or multifamily housing with income- or needs-based eligibility. 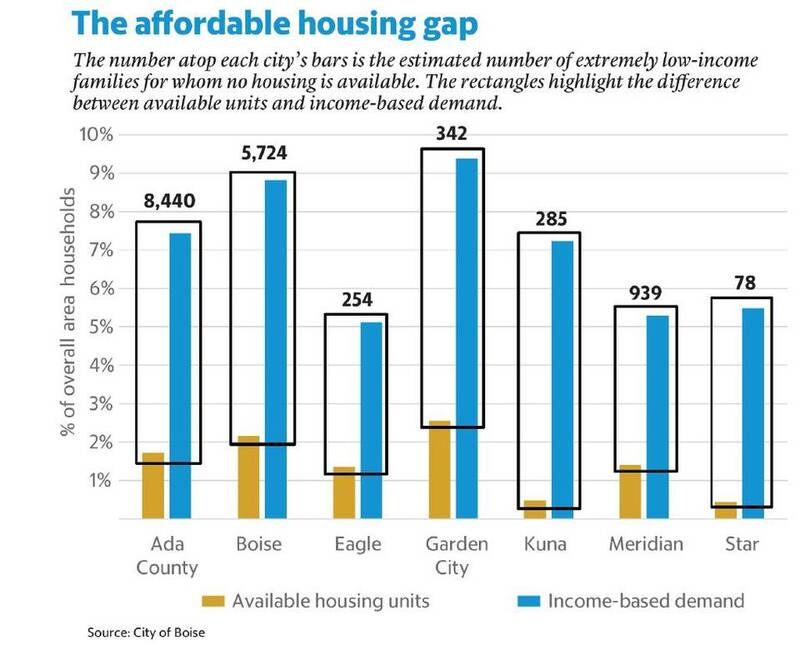 In Boise and elsewhere, the number of renters spending more than 30, 40, or even 50 percent of household income is significant, and we currently have a shortage of housing within reach of many individuals and families. According to current figures, housing is out of reach for an estimated 5,700 very low income Boise households. This means many households are living less than a paycheck, injury, illness or divorce from homelessness. 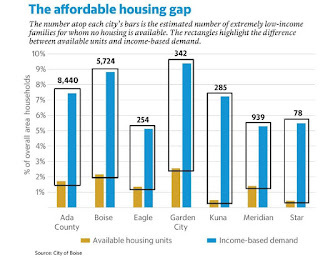 Recent articles in the Idaho Statesman illustrate the need for additional housing options for lower-income households. The lack of housing diversity in our downtown core has impacts on transportation infrastructure, workforce reliability and air quality as well. Speaking with Idaho Statesman reporter Zach Kyle, local developer Dave Wali and other leaders get this connection. We need to anticipate and adapt to a changing landscape. As Mayor Bieter correctly pointed out in a recent mayoral candidate forum, "...you want to fix the roof while the sun shines." We agree; you don't wait until it's raining to fix the roof, and we shouldn't wait until we have double or triple the current number of people on the streets to explore workable housing and shelter alternatives. We have now entered a new normal. The Boise Weekly has been devoting significant time and ink to challenges around homelessness. It's helpful to understand all the efforts being undertaken by the city and others to cultivate both short- and long-term solutions. The City of Boise is pursuing permanent supportive housing and a 'Pay for Success' model to incentivize third parties to create housing and and services (like case management or counseling) for persons currently experiencing homelessness. Read more on that here. Support for the city's long-term goals. The members of BASC fully support the city's efforts to create permanent supportive housing, as well as expanding housing types and price points that offer affordability and stability to people at all income levels. We encourage other stakeholders to support their efforts as well. A citizen-driven, private grassroots is a natural response to perceived needs involving homelessness, and BASC efforts are informed by successful faith and community partnerships in the NW that are proving effective and affordable for economically displaced people. These are folks for whom local housing is simply out of reach and for whom congregate shelters may not be the best option. We appreciate that the city of Boise (and any city) would have legitimate questions about any alternative approach. That said, our efforts should not be construed as critical of others, including city leadership. Just as no two people are identical, the solutions needed to stabilize displaced individuals will naturally be diverse. Incivility by others towards city in the press or public does not represent BASC, it's active members or values. We can disagree without being disagreeable, and we know that today's perceived adversaries may be tomorrow's allies. Open and honest evaluation of ideas and strategies is what makes a democracy work. October 7th Homeless Forum. George Prentice also served as the moderator for a well-attended forum on homelessness sponsored by Transform Idaho. Panelists included Police Chief Bill Bones, Homeless Coalition President Barbara Kemp, Diana Lachiando from the Mayor's Office and Ada County Commissioner Rick Yzaguirre. Read more about that discussion and view some video from the evening here. Many in the audience posed questions on the 3" x 5" cards provided and were confused when the questions didn't surface in the discussion. Following the Forum, the needs of Cooper Court residents have been assessed by volunteers coordinated by CATCH. This is a critical step to inform efforts going forward. Andrew Heben Presentation. The event on November 19th is not a forum on homelessness in Boise; it is a presentation by a widely recognized author and expert on the rise of tent cities and tiny house villages, and on the planning, political, environmental, economic and social implications of these constructs. This is a national and international conversation; it is by no means about any one community. Listening Session. Members of BASC and Transform Idaho are planning a 'listening session' in early December with the goal of giving folks without housing a chance to speak up in their own words. Our long-term goal is for the many people and organizations of conscience to work more collaboratively, finding space to address diverse community needs while making best use of taxpayer dollars and community capacity both private and public. These are not Tiny Houses. Tiny houses have their own bathrooms and kitchens, they feature plumbing and electrical service and often use propane appliances. Some are built on trailers or are classified as recreational vehicles; others are placed on fixed foundations and built to local codes, where allowed. 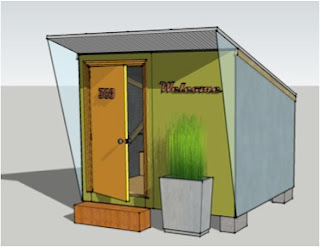 Typically tiny houses may range from under 100 square feet to a few hundred square feet. Material costs for a DIY tiny house often start at $6,000 to $7,000 and can go much higher. While there are community and economic development reasons to create both physical and regulatory space for tiny houses, we also see a value in more economical options. The structures we'd like to experiment with could best be thought of as 'detached guest rooms.' They don't have their own kitchens or bathrooms, but those amenities are shared to create efficiency. The primary purpose of the personal shelter is to provide privacy, personal safety and security, along with protection from the elements and predators. There are great examples of tiny houses and villages, including Quixote Village in Olympia, WA. The net cost per unit (accounting for cash, infrastructure and in-kind investments) exceeds $100,000. A more local example intended to house individuals experiencing homelessness is the Boise Tiny Houses for the Homeless project.